These incredible sheets are actually satin fabric with a fine paper backing. They are imported from China and the patterns are based on classic Chinese fabrics and motifs. 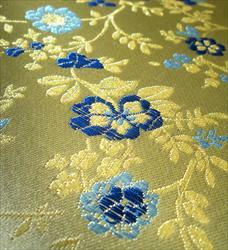 Each sheet shines and shimmers as it moves, as the light picks up the delicate stitching of the fabric. They are exquisitely beautiful and our photos do not do them justice- you have to see (and touch!) the sheets to fully appreciate them. We have included two images to illustrate each sheet- the main image shows what the pattern of the sheet is, and the second image shows a detailed close-up so that you can see just how beautifully made these sheets really are! Perfect for use as book cloth, with all bookmaking arts, scrapbooking, collage, card making, and more. These are so gorgeous, you can even hang them on the wall as finished artwork!